Please allow one to two business days to receive your engraving proof via email. After approval of your engraving proof, please allow five to seven business days for the creation of your personalized A.JAFFE Map before item ships. Due to the custom nature of this item returns not accepted. Celebrate your favorite place with a custom map necklace pendant. 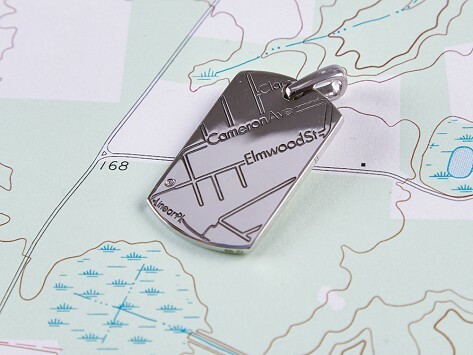 Laser-etched sterling silver highlights a special location from anywhere in the world. A handset diamond marks the spot and adds some sparkle, too. Made in NYC. Dimensions: Heart: 0.75" x 0.75" x 0.01"; Circle: 0.75" diameter x 0.01"; Dog Tag: 0.6" diameter x 1"
Whether it’s a first home or a favorite vacation spot, a pendant captures and celebrates a meaningful location and keeps it close to you.